I know Ketan rice, but the white version. This is black ketan (hitam) and today I make black ketan porridge or sticky black rice porridge. This amount is enough for 4 people and takes about 2 hours to make. Bubur ketan hitam # 553 translated from Beb Vuyk’s Groot Indonesian Cookbook, page 436. Bring water to the boil and add the washed ketan. Leave it on very low heat (if you work with gas use an asbestos plate) and cook it for ± 1 1/2 hours. Melt the sugar together with 1 cup of water into a syrop. Strain it and mix it through the ketan rice that is done. Let the dish simmer for an extra 5 minutes. Serve it with thick santen (coconut cream) through which a pinch of salt has been stirred. This dish can be eaten hot or cold. The ingredients are clearly simple; some black rice, sugar and water. As a condiment you also need some coconut milk with salt. You add this just before serving. I buy the black sticky rice at an Asian store. These wonderful long grains come in black and brown colors. I immediately get all sorts of recipe ideas. I like to make black glutinous rice balls with serundeng or black lempers! Next time. Now I have to concentrate on Beb’s recipe for porridge. 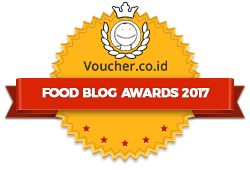 My father always told me that he got all kinds of bubur made by their home cook (kokkie). Bubur with chicken or sweet porridge, like this bubur ketan. The grains should be rinsed well, says Beb. I fill up my bucket of rice with water and stir it through with my hands. The water immediately turns to aubergine. That’s beautiful! Now it’s time to slow cook the rice for 90 minutes on very low heat. You can also soak the rice overnight. Than cooking time is shorter (about 60 minutes). I bring one liter of water quickly to the boil with the rice already added. Now I turn the heat down and let it simmer with the lid half on the pan. It looks like witch soup. I do not use an asbestos plate, like Beb suggests. This recipe book was written before we knew asbestos is a dangerous material. I just place my pan with a thick bottom, on the smallest gas burner and turn it very low. After 10 minutes the kitchen smells delicious. The rice itself has a sweet coconut scent. I let it simmer quietly and stir it through occasionally. The rice has been simmering for an hour now. I’m going to melt the sugar in 1 dl of water. I use ordinary palm sugar here. But I like gula jawa better. You can also opt for (dark) brown sugar. My rice is done now. It has simmered for 90 minutes. I add the sugar syrup and leave it to cook for another 5 minutes without the lid. The porridge thickens now. The porridge can be eaten hot or cold. I’ll serve it with some coconut shavings. That gives a ‘bite’ and looks beautiful. I also mix a pinch of salt through the coconut milk and pour a good amount over the porridge. Or I serve with salt, so you can decide yourself how much you like in your porridge. The salt really does a lot to the bubur. It deepens the flavors immediately. Then the overal flavor. Not bad but this porridge is water-based. That’s why it does not taste like typical porridge to me. I remember from travelling through Indonesia that almost all Indonesian porridges do taste a bit watery. The porridge in the Netherlands – I love porridge- is usually based on dairy products. That gives a creamy flavor. For me that is how porridge should taste ;-). That’s why I make my bubur ketan hitam one more time, but now I add 60 grams of santen (hard coconut cream) in the water during cooking. I also add a fresh pandan leaf. Now it looks even more like witch soup. The coconut colors everything even more purple. So beautiful. The porridge has become a bit creamier and has lost the watery aftertaste! Because my porridge is still hot, I pour cold coconut milk and serve with gula Jawa syrup and a pinch of salt. Delicious! 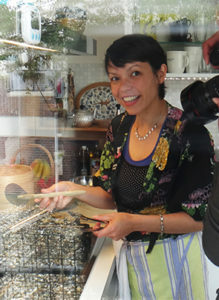 Beb Vuyk, best known for her Groot Indonesisch Kookboek (Great Indonesian Cook Book), was much more than a great cook. She belongs to the most important Dutch-Indonesian (Indo) writers and journalists of her time. Check this out. Like your niece said, cook the ketan with coconutmilk or even add some condensed milk. The round black slices of gula jawa (Javanese palm sugar) taste better than the white or yellow sugar varieties. Experiment by adding a pandanus leave in the white coconut sauce. Extra yummie taste. Try this. I think it’s called bubor hitam.